And now is not the time to load up on product: "It's super important for your stylist to see your natural texture. It can be varied in different areas of your head, so they may have to cut accordingly," explains Townsend. Show up sporting your go-to-sytle. "If you normally let your hair air dry and pull it into a ponytail, go with that. 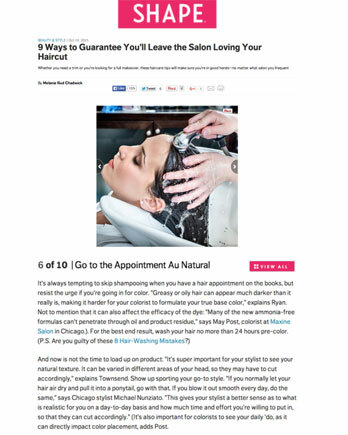 If you blow it out smooth every day, do the same," says Chicago stylist Michael Nunziato. "This gives your stylist a better sense as to what is realistic for you on a day-to-day basis and how much time and effort you're willing to put in, so that they can cut accordingly." (It's also important for colorists to see your daily 'do, as it can directly impact color placement, adds Post.